Blue Tansy is a favorite essential oil for many aromatherapists because of its wide range of therapeutic benefits. In addition to being an excellent calming and clearing oil, it can even help with inflammation. 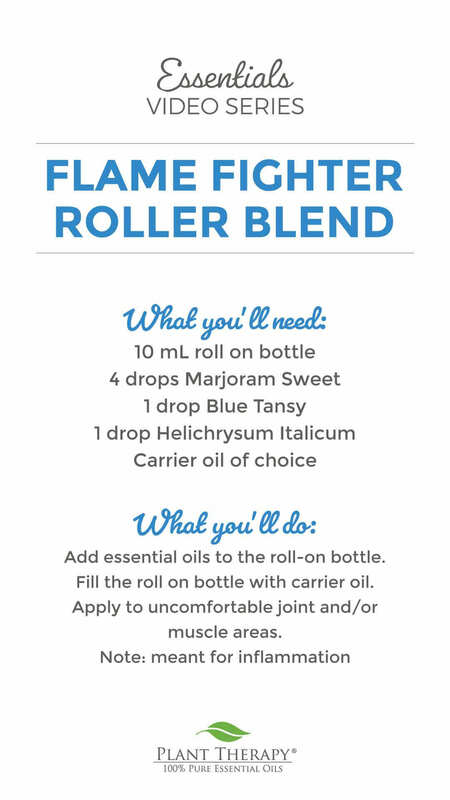 The Flame Fighter Roller Blend also takes advantage of the muscle and joint soothing benefits of Marjoram Sweet. So combine these essential oils in your favorite carrier oil and apply to joint and muscles areas to help ease pain and discomfort! 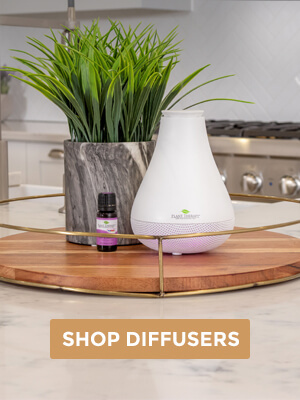 Add essential oils to the roll-on bottle. Fill the roll on bottle with any carrier oil. Apply to uncomfortable joint and/or muscle areas. I need to add blue tansy to my collection asap o keep hearing about All the wonderful things a out it, I think it’s about time I try it myself. Blue Tansy is not in my collection yet but it will be soon! I’m hoping the flame fighter will help with my injuries and multiple chronic illnesses. Thank you PT for all of the wonderful DIY recipes! been because I really could use a good blend for imflammation. I made this blend. It did seem to help with pain/inflammation. Easy recipe and smells fairly well too! Thanks PT for the recipe! Marjoram is on the mail already. Can’t wait to order the other oils to try this blend. I can’t wait to try try this for inflammation! Going to get some marjoram soon and make this! This is ideal! I have all of these ingredients and plan on making this tomorrow. My hands and shoulder always hurt. Hopefully this will give me some relief! Thank you PT for all the wonderful ideas! A dear oily friend made this for me after dropping a bucket of water on my foot and breaking my toe. ( I did not have Blue Tansy) Wow , does it work well !!! Thank you for sharing all of these magical recipes !!!! I am going to try it for my post workout oil!!! Excited!!! this would be so good for me as i have chronic pain over my shoulders and arms. Can’t wait to give this a go. Thanks plant therapy! I have the exact same issue and I bought the Blue Tansy for that reason! It has arrived now and I will make this tomorrow. I hope that it works for you and for me! I also bought the Marvelous Massage carrier oil blend, and I think that I will try that for this purpose. So excited to try this blend. We are not able to diffuse blue tansy in our home because it triggers afew of our migraines. This may be a way to use up the blue tansy I have left. Yay! I love Blue Tansy for my allergies. Looking to try it in this recipe! I already use blue tansy for this but marjoram sweet is a new ingredient for me. Can’t wait to try this recipe. Thank you so much for this recipe. I haven’t blended my Blue Tansy yet with anything and this looks interesting as I am always looking for roll ons for inflammation and pain. Blue Tansy is my all time favorite! I had no idea it could be used in an anti-inflammatory blend. I’m definitely going to try this! Thanks. Hope this works for my son. I get these painful nodules around my knuckles. They just pop up out of nowhere. They go away within a day, but it feels like broken glass. Severely limits bending my fingers. I made a quick batch of this blend. I am hoping for good results! Always looking for recipes to relieve pain and inflammation and this is a new one for me. Can’t wait to try it once my Blue Tansy gets here! Making this blend today. Thank you for sharing, it is just what I’ve been looking for to try out my Blue Tansy. Thanks! This sounds amazing. I have been struggling with pain in my hands and cannot wait to try this blend. Thank you for the recipe! This will come in handy as I just started back at the gym and I’m super sore! Will have to give this a try, always looking for ways to stop pain in my hands. Thank you for this fantasic video. I love that you give tips and ideas and diy! You guys rock! I like you the more I learn about you! I’d been on the fence about taking advantage of the spotlight on Blue Tansy. This just sealed it. I look forward to trying this for Fibromyalgia and general aches and pains from my martial arts classes. Thanks for the recipe! My husband recently had a flare of up an old knee injury. Today, I ordered the oils to make this blend. Thankfully, he loves oils too and doesn’t mind me “experimenting” on him. He calls them my “magic potions.” Lol! I can’ wait to make this for him! The oils sound like perfect way to help alleviate his pain and swelling. Thanks for this great recipe! I am just wondering, can I add 1 to 2 drops of Fantastic Frank to the recipe given its benefits for sore joints and muscles? Thanks for the recipe. I’m always looking for new ideas. Looking forward to making the Flame Fighter for my husband’s inflammation problems. So glad to see Blue Tansy on Spotlight…thanks PT! Nice! I’ll definitely be adding this to my first aid kit! What dilution % is this DIY? 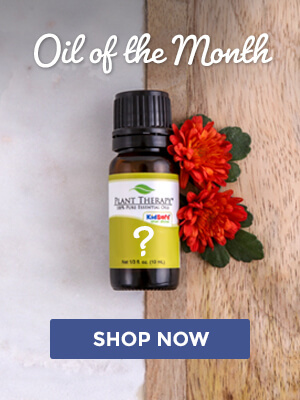 When I first heard about Blue Tansy eo, it was in a recipe for diy no-see-um repellent. At the time, there was no Blue Tansy eo to be found. Eventually I was able to acquire a bottle and since then I use it in all of my insect repellents and I have been very happy with it. Now that I have read this blog I am going to try it out for its anti inflammatory properties. I’m glad to have a new use for this oil! I was on the fence about ordering blue tansy and came to blog to look for something else and saw this! ordering it today! I love that there is so much information at my fingertips! PT you guys are the best! Waiting for my blue tansy in the mail. I didn’t know that it was good for inflammation or marjoram was either, I use marjoram for sleeping. I can’t wait to make a batch of flame fighter. I’m wondering if i could add some copaiba for pain relief?! I have a few family members that need to see this. Sharing with them now. I’ve been looking for helpful ideas for my blue Tansy, and this looks amazing. I can’t wait to try this! I recently bought Blue Tansy. 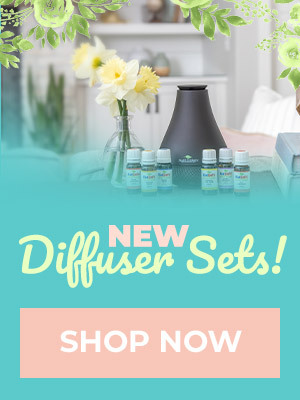 Thanks so much for a new idea on how to use this essential oil.